Progress…I believe that I have acquired some recently. Progress in thought that I have adjusted to the new routine of not working daily. Well, sort of. 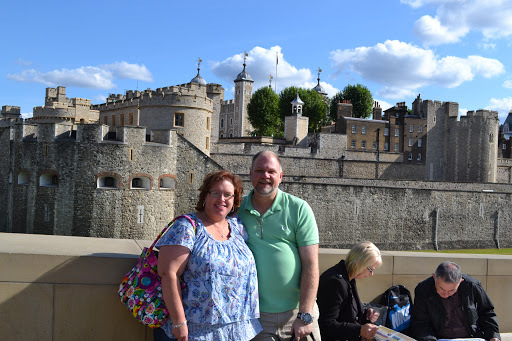 I had the privilege of meeting my hubby in London in September. Wonderful. We haven’t seen one another for about 4 months. So it was a good break from his work in Bagram Air Base (Afghanistan), and for me to confirm the decisions that we have been making. Yes, we did all of the tourist stuff, and many museums. David is a geek of sorts, and loves armor and history. I love the Queen, and everything about the Monarchy. So we compromised and got to see what we both wanted to see around the city of London. We didn’t really travel out of the city. We took our time each day and discovered things that we would not have gone to if serendipity hadn’t occurred. Walking everywhere in London wasn’t easy, but it was fun to do especially with David. But most of all, I really enjoyed just spending time with my best friend. Talking about our past, present and future. We enjoyed the time with one another. David is now back in Bagram (prayers always appreciated), and I am back home with the kids and their schedules. It was really good to be connected with him again. I think both of us were a bit lost without the other for a while. The camera ad above is my new camera (got it for my birthday)…and yes, we took lots of pictures in London. By lots, I mean 1928. Yes, that number is correct. My dear hubby took most of them, and the majority of them are pictures of items in museums (like game pieces that the Romans had played). I did tell you he was a geek right? I do love him, so very much. It is taking forever for me to sort through them though. ha. Such is life, right? On another note, my IV therapy’s have been going very well, (I do them once a month for about two hours) and I believe that I am doing better with the day to day of living with Lupus. The daily stress is gone from work although I truly miss the daily activities of the church. Christine does a wonderful job explaining hidden illness and how we deal with it on a daily basis. So, progress. I just wanted to update all of you. Life is good, today is better than yesterday.